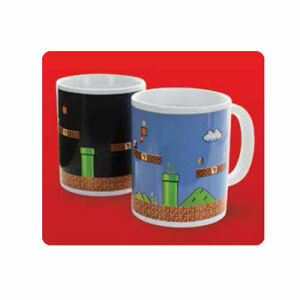 We have Just Sold out of Super Mario Bros. Heat-Change Mug. Not to Worry! Fill in the Notify me When Available and you will be the first in line for our restock of Super Mario Bros. Heat-Change Mug !! From the Nintendo Super Mario Brothers collection by Paladone Products. Super Mario Bros. Heat-Change Mug. When you add hot liquid the Super Mario Bros. Heat-Change Mug the game background turns blue.